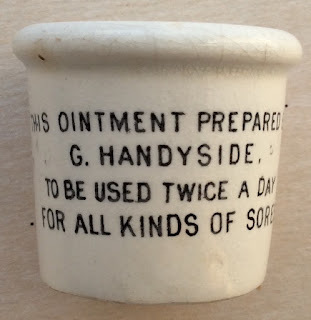 George Handyside was born in 1821 and became involved with the medicine business in the 1880's. In 1889 in Ward's directory he was listed as a 'consumption cure manufacturer'. In 1894, the Kelly's directory records him as a 'herbalist' so it is quite likely that this is the time when Handyside started to produce the ointment. George Handyside lived to the ripe old age of 83. Quite a simple pot but difficult to find one in good condition. Once a rare pot, now relatively common due to large numbers being discovered. An article appears in BBR magazine no. 85 suggesting that values have dropped quite considerably as a result of the large numbers that have been found. book produced by Messrs. Houghton & Priestley, page 76.